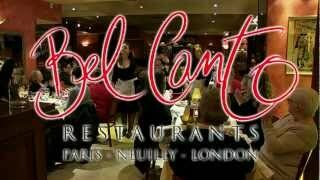 At Bel Canto, a carefully-orchestrated team of attentive waiters is supported by a quartet of singers, accompanied by a piano. Every fifteen minutes or so, one, two or all four of the singers perform parts of renowned arias from Carmen, Don Giovanni, Tosca, The Magic Flute or La Bohème. The proximity with the singers makes the experience all the more exciting and emotional for opera lovers and curious diners alike. Offer: Dinner & Show package, including the show, the semi-gourmet dinner with an à la carte 3-course menu (starters /main course /cheese or dessert). Drinks not included.